I was bullied as an adult. And no, I’m not talking about the playground kind of bullying where I was called names or made to feel left out of a group or laughed at, but it was very close. I worked for a bank for nearly a decade. Nearly because right as I was closing in on my decade mark, I had the unfortunate luck of going through one of the most difficult periods of my life during which my niece, who was in my care a lot, was diagnosed with Leukemia at the age of four. And during that period, to make matters worse, was my boss—a senior executive who hated anyone and everyone. And this lady made my days at work. Absolutely. Miserable. We’ve all had that one horrible manager. You know what I’m talking about. Mine used to scream in a high-pitched voice, break out into a crying fit, bellow and breathe in short, huffy spurts like the big bad wolf, making me fear that she’d either pass out or pop a blood vessel—and then sue me for it. It’s by far the worst experience I’ve ever had working for anyone. I remember days eating and sleeping at the hospital, running around with my laptop and sneaking into deserted hallways to take meetings. Till this day it still surprises me that this woman is a senior executive at a globally known bank. Everyone despises her. In fact, in my mind, I’d secretly dubbed her Miranda from The Devil Wears Prada. I eventually quit my job for several reasons—and she was definitely the cherry on top of my sundae of excuses. Now, nearly a year later, I can stay calm enough to share with you my story and to offer some tidbits of advice to help you along if you ever face an adult bully. They’re worse than the kids on the playground, because their tactics aren’t as apparent but equally if not more hurtful to you not only emotionally but also mentally. So if you ever have the misfortune of coming across an adult bully, take a deep breath, calm down and follow these steps. Often times, bullies are bullies not because there’s something wrong with you—but rather because there’s something lacking in their lives. Take for example my former manager, who we’ll call Miranda. She was going through a divorce when I joined the team, and I attributed this to her rough behavior at work. However, after speaking to some coworkers who she’d brought to tears on more than one occasion, I realized that perhaps her behavior wasn’t a result of the divorce, rather her divorce was a result of her unacceptable behavior. Meaning something had likely happened earlier on in her life to shape her deplorable attitude. Because like Miranda have larger issues within themselves, they turn to bullying to exploit others and turn attention from their own pains and insecurities. When you’re confronted by a bully, sometimes it can help you feel better or more tolerable toward their jibes if you understand the root of their insecurities or aggression. If it’s a manager, perhaps he is insecure about the progress you’re making in your career path and are miserable and stagnant in their own job. If it’s an acquaintance, maybe she is jealous of the relationship you share with your husband, or maybe a friend is envious of your financial stature because he is suffering through money woes. There’s always a driver behind bully behavior. Sometimes understanding why the bullying is happening can help you better choose to ignore it or do something about it. For example, if you know that someone went through a life-altering event, like losing a child, that changed their behavior and outlook on life, you may choose to ignore their obnoxious jibes. But if you can’t put a finger to the root cause, and the behavior is impacting you and your life in a strong way, it’s probably time to take action. Bullies often have a radar for the perfect targets. If you’re someone who is easy to pick on, quiet, passive or too nice (which is often perceived as a weakness by bullies), you might be making yourself an easy target for the bully. Also, you have to know that bullies like getting a rise out of people. They like feeling authoritative and love the ability to make others feel powerless in their company. If you give into this power play, you’re likely to continue being an effective target for the bully, but if you learn to ignore him and not give him the satisfaction of knowing that he’s had any kind of impact on you, it’s possible you’ll be let off the hook. Try your best to keep your cool. Laugh with them when they laugh at your expense, shrug at their jabs, and ignore them when possible. Reacting unexpectedly and rolling with the punches might yield you better results than to let them see how their words have impacted you. When all else fails and the bully is still the last one standing, it’s definitely time to step up. Sometimes passiveness and ignorance may encourage the bully to pick on you more rather than to give up. If this happens, you have to fight back—because the one thing that can give a bully pause is someone who won’t take his punches sitting. The best way to confront a bully is to remain matter of fact and calm. Don’t let emotions rule, rather state the facts and tell the bully how her actions have made you feel. Try to be as mature as you can. Bullying is a childish tendency, so it’s tough not to respond in a childish way, but remember that by being mature and calm and not starting a screaming match, you’ll increase your chances of getting through to the bully and hopefully resolve the bullying once and for all. 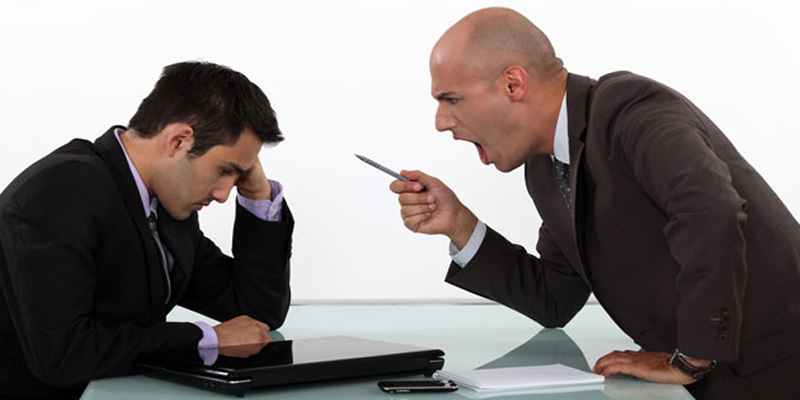 If the bully happens to be your manager and you’re afraid that something you say may be misconstrued or used against you, don’t be afraid to engage help from someone in your HR department or from your manager’s colleague, preferably someone you trust and feel comfortable with. Having a third party present to mediate can prevent false allegations and stop the confrontation from getting out of hand. While it’s great to learn how to stand up to a bully, also remember that being a silent bystander when someone is being bullied is just as bad as doing the bullying yourself. Your silence will only serve to encourage the bully. Taking a stand when someone is being bullied will not only serve to throw the bully off his tracks, but also the person being bullied, and even other bystanders, will respect and admire you for your courage. Even better, it’s likely you’ll lessen your own chances of becoming a victim in the future.